In June, 1998 I visited the Limie Show in Charleston, Mass. While this show is primarily devoted to older British bikes, people bring what they want. I spotted an old American bike that looked about my size, with a $25 price tag on it, including a nice one-piece crankset with a 26 tooth "skip link" chainring and a matching chain. It looked like a fun project, even though it was missing the wheels, saddle and seatpost. I assumed at the time that it dated from the late '20s, but have since learned that it's from 1916 or earlier. It was cheap enough, and the bike was in rough enough condition that I didn't feel it needed to be preserved and restored as a museum piece. It did look as if it might be fun to build up and ride. 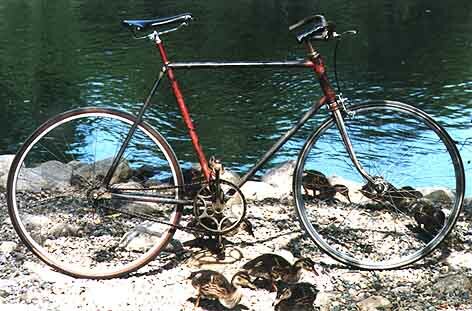 The bike was built for the old 28" single-tube tires and wood rims, which were popular in the 'teens and twenties. Rims for this size are scarce, and usable tires even scarcer, but since I had no intention of doing an "authentic" restoration, I really didn't need such exotic wheels. I had a couple of fairly nice 27 wheels at home, the rear with an old Phil Wood track hub...I also owned an 8 tooth 1" sprocket, so I really had everything I needed to make the bike into a "rider." I later acquired a 10 tooth sprocket for the other side of the flip/flop hub, but I prefer the 8...wish I could find a 9! The 26 tooth chainwheel gives me a gain ratio of 6.56 (87.5 inches / 7.02 meters. The 10 tooth sprocket gives me a 5.25 gain ratio (70 inches / 5.62 meters). I mostly ride this bike on the 8-tooth sprocket, and choose routes that avoid hills. On the flats, it really hauls! ...This just in...February 1999...Ward Curtis, of Mt. Tabor Bicycle in Portland Oregon read the above and very kindly sent me a 9 tooth sprocket that had been kicking around in the bottom of his toolbox. Thanks a bunch, Ward! I had never heard of Mead, or the Mead Ranger before, though I hope to learn more about the brand. Although this bike has had a hard life, it was a very high quality machine in its day. The one-piece crank and its bearing set are the nicest of the type I've ever worked on. The headset too is beautifully made, and appears to be nickel plated. 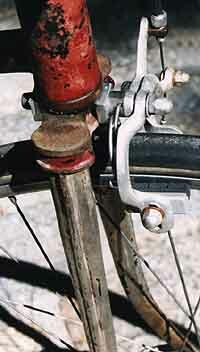 The seat stays are oval, and meet the seat tube in a nicely executed "fastback" seat cluster. At a casual glance, it looks as if the frame was welded like a garden-variety old American bike, but from some material kindly sent to me by Calvert Guthrie, I learned that the frame was "crucible brazed", by being dipped in molten brass. The joints are internally lugged and pinned. The fork is the old pre-dropout style, where the ends of the fork blades have holes, not slots. 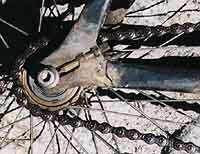 You must spread the fork blades to install/remove the front wheel. The blades have unusual ridges running down along their outer edges...not very "æro," but elegant. The bike was probably originally equipped with a coaster brake, but I built it up as a fixed gear. Not being a complete fool, I drilled the fork crown and installed a very inauthentic, but effective brake. I've become completely addicted to SPD pedals, and all of my shoes are SPD compatible, so, in a further anachronism, I've installed a pair of imitation SPDs, the BMX/downhill variety with a big clunky cage. Unfortunately, that's all that is avaialble to fit the 1/2" threads used on one-piece cranks. I've been more than a little surprised at how nicely this bike rides...it's easy to get carried away with all the bells and whistles of modern bikes, but it's an eye opener to find how nice a 70-80 year old bike can be, and how little real change there's been over the years. In any case, I really get a kick out of riding this smoooth, responsive bike. "What you have is what's left of a model known as the Ranger Roadster. That frame was sold under several model names and with different equipment and colors...but just as you have it there (black with red trim, no mudguards, that particular inch-pitch chainwheel sprocket) it is a Ranger Roadster. We have it exactly in our 1916 edition of the annual Mead Ranger catalogue, however it changed for 1917 and later. 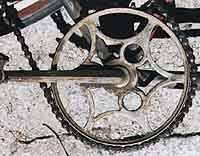 And yes, it very definitely had a coaster brake when new (we cringe at modern modifications). "As for Mead Cycle...it was one of the most famous bicycle companies in the world and had huge plants at one time in England and here in Chicago. They primarily were a mail order operation and sold bicycles worldwide. They had several lines of bicycles, but their premier line was the Ranger line. Most Rangers were painted a famous color, "Ranger Brown"...however your bicycle was offered in 4 different color combinations, one of which you obviously have." Calvert Guthrie was kind enough to send me this picture from a 1915 Mead catalogue, among other neat Mead stuff.